I was able to show my son the cabin I sweated out my first voyage. 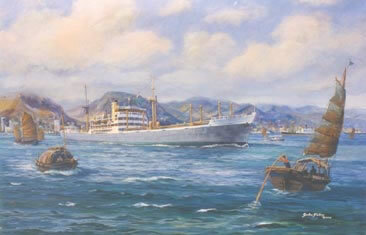 A rare glimpse of the port of Hong Kong circa 1955, to produce an accurate background and other shipping, Gordon Frickers researched with Hong Kong people to find appropriate period photographs. This painting is a typical example of a commission that has become a family treasure and heirloom.